One of the upcoming days, when we both have some spare time, we will sit down in front of my own laptop, running the new and freshly updated Fedora installation to try Linux for the first time. 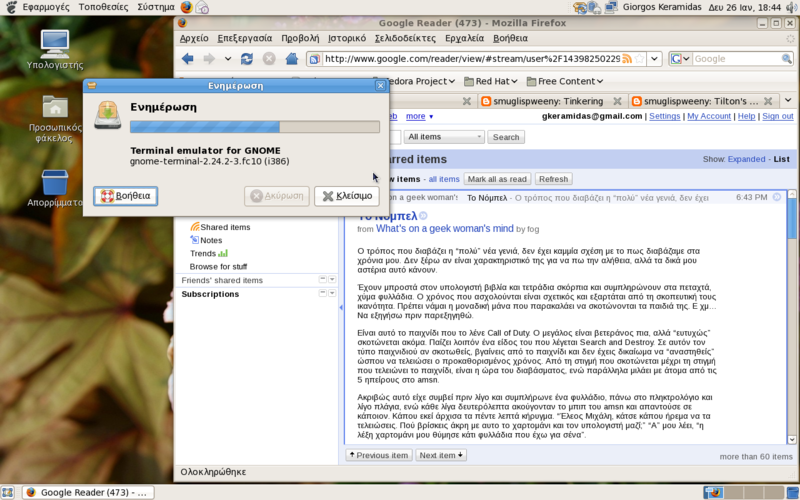 This entry was posted in Computers, Free software, GNU/Linux, Linux, Open source, Software, Windows and tagged Computers, Free software, GNU/Linux, hellug, Linux, Open source, Software, Windows on 2009-01-26 by keramida. After my Canon i320 printer died earlier this week, I purchased a new HP D2460 this afternoon. One of the computers which has to use this printer is a Windows machine, which is mostly used by the people who stubbornly refuse to stop using Microsoft Office at home. Unfortunately, the onus of “supporting” the idiotic joke from Redmond which pretends to be an operating system, falls on me. This entry was posted in Computers, HP, Software, Windows and tagged Computers, hellug, HP, Software, Windows on 2008-01-23 by keramida.